To be more specific, we spoke for over an hour about many human rights issues. The meeting was indeed a welcome change from encounters with the previous two governments, which refused to meet with Human Rights Watch at the highest levels to discuss the human rights situation in Bangladesh. The meeting was serious, befitting discussions of human rights in a country facing many serious challenges. Among the issues we discussed were the war crimes tribunal process, the pending anti-torture bill in parliament, court cases against officials of the Bangladesh Centre for Workers Solidarity, the arrest and treatment of Moshrefa Mishu, the situation in the Chittagong Hill Tracts, and the trials of suspects in the BDR massacre of 2009. We cited specific concerns and made recommendations. The prime minister, the foreign minister and other officials listened carefully and explained the government's position on these issues. One subject we discussed at length was the continued large number of extrajudicial killings by the Rapid Action Battalion. 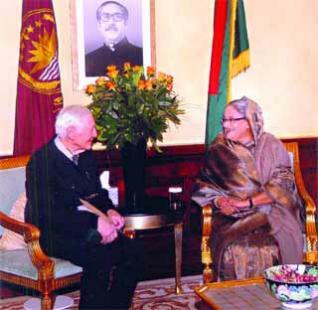 The prime minister pointed out that RAB was created by the Bangladesh Nationalist Party-led government and used against criminals and political opponents, including members of her own party. She said her government does not order RAB to target members of the opposition or order the killing of specific individuals. She said she had opposed RAB's behaviour while in opposition. I explained that Human Rights Watch had been documenting RAB killings since it was set up. As far back as 2005, we published a report titled ‘Judge, Jury and Executioner', which showed in detail how RAB targeted individuals for killings, often after severe torture. I reminded the prime minister of her announcement of a ‘zero tolerance' policy towards extrajudicial killings in 2009. I pointed out that despite this statement RAB continues to carry out large numbers of ‘crossfire' killings" and that no RAB official or officer has ever been prosecuted for such killings. Whether political officials order RAB killings or not, it is the responsibility of the government of the day to ensure that government security and law enforcement forces do not abuse human rights. When such abuses occur, it is the government's responsibility to take swift action against perpetrators. I expressed dismay at the statement last week by the home minister, Sahara Khatun, that there had been no extrajudicial killings in Bangladesh since the Awami League government came to power in 2009, a statement that bears no resemblance to reality, as even a cursory examination of Bangladeshi newspapers makes clear. I told the prime minister that this statement and similar ones by other government ministers in the past two years call into question the government's commitment to end this scourge, which is now gaining regular international attention. The prime minister told us that she was committed to ending these killings but said this problem could not be solved overnight. This may or may not be true: the killings almost completely stopped in early 2009 when the new government took office, perhaps because RAB was concerned about how the new government might react to continued ‘crossfire' killings. In any case, I suggested that there are things the government can do right now. It can require, including through legislation, an official and independent inquest into every death at the hands of government forces. This is a common approach in democratic countries. Such inquests would allow the truth to emerge in cases in which RAB or other law enforcement officers kill an individual. They would provide a forum for RAB to present evidence of self-defence, which RAB regularly claims as the reason for killings. At the same time, they would allow victims, their families and others to present evidence of illegal killings, torture or unlawful detentions. Proper inquests would also allow the public to know the truth of what happened. The government can act immediately to show its commitment to ending abuses by beginning criminal prosecutions in cases where there is clear evidence that RAB has acted unlawfully. Human Rights Watch has provided such documentation to the government in the past, but has received no formal reply. The prime minister has now asked us to send such information to her, which we will do. One case she could look into is that of the brothers Lutfar and Khairul Khalashi. They were arrested by RAB on November 13, 2009. Because of RAB's long record of killing people in custody, the following day family members organised a press briefing in which they urged the authorities to ensure that the brothers would not be not killed while in custody. Yet two days later, on November 16, 2009, RAB announced that both had been killed in ‘crossfire' with a RAB patrol team early the same morning. RAB provided no credible explanation for the killings. Human Rights Watch appreciates the statement issued by the prime minister after our meeting on 30 January that ‘If anyone found guilty after investigation for extrajudicial killing, we will take action against the persons as we believe that all citizens have the right to get justice.' Our goal as human rights activists is to help the government turn these aspirations, expressed repeatedly in the past, into action. The victims and their families deserve no less. Brad Adams is the director of the Asia division of Human Rights Watch.